BURBANK, CA - 07/14/2016 — Offering insights into the complementary fields of spirituality, sustainability and ethics, Woodbury University Business School professors Satinder Dhiman and Joan Marques have collaborated on Spirituality and Sustainability: New Horizons and Exemplary Approaches, a new compilationpublished by Springer, with a foreword by noted organizational theorist Ian I. Mitroff. 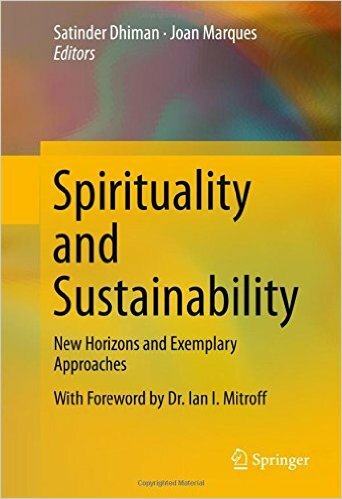 The book examines sustainability and spirituality philosophically with ethics as the balancing force. The goal, according to Drs. Dhiman and Marques, is to reveal the important intersection between spirituality and sustainability by using spirituality as the invisible guiding hand in the quest for sustainability. Contributions cover a broad range of topics – from sustainable development and human happiness, to contemporary spirituality and environmental ethics and responsibility, to corporate social responsibility. Essays are interwoven with real-world case studies and discussion questions aimed at fostering theoretical and empirical deliberation in academic courses and business seminars. Contemporary approaches to economic and social development have failed to address humankind's abiding need for spiritual growth, Drs. Marques and Dhiman suggest. “For material development to be sustainable, spiritual advancement must be seen as an integral part of the human development algorithm,” they write. “While the policymakers and governments can play their respective roles, each one of us has to consciously adopt spirituality and sustainability as a way of life.” The book taps the spiritual power of individuals to heal themselves and the environment and features interdisciplinary perspectives in areas such as science, marine biology, environmental policy, cultural studies, psychology, philosophy, ecological economics, and ethics. Satinder Dhiman, PhD, EdD, serves as a Professor of Management and as the Associate Dean, Chair, and Director of the MBA Program at the School of Business. He has served as the Chair for a special MBA Program for Mercedes-Benz executives, China. He also consults as Accreditation Mentor and Site Visit Team Leader for the Accreditation Council for Business Schools and Programs (ACBSP) for various universities in America, Canada, Europe, and India. He has been elected as the President of International Chamber for Service Industry (ICSI), 2014-2016. He has completed advanced Executive Leadership Programs at Harvard, Stanford, and Wharton. The recipient of several national and international academic and professional honors, Dr. Dhiman won the Woodbury University Ambassador of the Year Award in 2015, the Steve Allen Excellence in Education Award in 2006, and the prestigious ACBSP International Teacher of the Year Award in 2004. In 2013, he was invited to be the opening speaker at the prestigious TEDx Conference @ College of the Canyons in Santa Clarita, Calif. He is the founder and Director of Forever Fulfilled, a Los Angeles-based Wellbeing Consultancy, which focuses on workplace wellness and self-leadership. Dr. Dhiman’s work has been published in multiple national and international journals, and he has authored, co-authored, and co-edited ten books on management and leadership during the last 7 years. His current research on fulfillment, which is also the theme of his book, Seven Habits of Highly Fulfilled People (2012/2014), is focused on transformative habits of mind for attaining lasting joy and fulfillment in both personal and professional life. In his most recent book, Gandhi and Leadership (2015), Satinder offers perceptive insights into the spiritual and moral mainstay of Gandhi’s exemplary leadership and its abiding influence on the world today. Joan Marques, PhD, EdD, serves as Assistant Dean of the School of Business, Chair and Director of the BBA Program, and Professor of Management. Her teaching focuses on leadership, ethics, and organizational behavior, and her research interests pertain to the same areas with specific focus on workplace spirituality and leadership awareness. She has been widely published in prestigious scholarly journals such as Journal of Business Ethics, Journal of Management Development, Business and Society, Journal of Organizational Analysis, Organization Development Journal, Human Resource Development Quarterly, Journal of Global Responsibility, Journal of Communication Management, International Journal of Organizational Analysis, and many others. Dr. Marques has authored/co-authored/co-edited more than 14 books on management and leadership topics, including Business and Buddhism (2015), in which Buddhism is approached as a leadership psychology, and Leadership and Mindful Behavior Action, Wakefulness (2014), in which she provides directives to leaders to adopt a wakeful mindset and abstain from the sleepwalking mode. She is also the author of Courage in the Twenty-First Century (2013) and The Awakened Leader (2007), and co-author of, among others, Leading Spiritually (2014), Business Administration Education (2012), Laughter is the Best Teacher (2011), Stories to Tell Your OB Students (2011), From Me to We (2011), Managing in the 21st Century (2011), The Workplace and Spirituality (2009), and Spirituality in the Workplace (2007). She is a co-founder and editor-in-chief of three scholarly journals: The Business Renaissance Quarterly, Journal of Global Business Issues, and Interbeing, Journal of Personal and Professional Mastery. She presents a weekly radio program titled “De Andere Kant” (The Other Side) on Mart Radio, and has been a long-time columnist for De Ware Tijd (The True Times), one of the largest newspapers in Paramaribo, Suriname. Founded in 1884, Woodbury University is one of the oldest institutions of higher education in Southern California. The university ranks 15th among the nation’s “25 Colleges That Add the Most Value,” according to Money Magazine, and is a 2014-2015 College of Distinction.. With campuses in Burbank/Los Angeles and San Diego, the university offers bachelor's degrees from the School of Architecture, School of Business, School of Media, Culture & Design, and College of Liberal Arts, along with a Master of Business Administration, Master of Architecture (MArch), Master of Interior Architecture (MIA), Master of Science in Architecture (MSArch), and Master of Leadership. The San Diego campus offers Bachelor of Architecture and Master of Architecture, Master of Interior Architecture and Master of Landscape Architecture degrees, as well as an MSArch degree with a concentration in Real Estate Development. Visit woodbury.edu for more information.